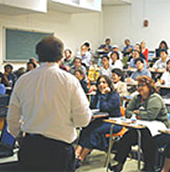 This all-day presentation is the cornerstone of GWSW’s seminar programs. It comprehensively addresses both practical and conceptual aspects that are important to writing competitive grant proposals. It is appropriate for faculty members, postdoctoral researchers and administrative staff who have had some exposure to writing grant applications, either through training / mentoring or personal experience. Each presentation is tailored to meet the needs of the audience, e.g., to focus on the funding agency or agencies (federal, private, and/or industry) that is / are of greatest interest to the attendees. Emphasis is given to doing the “extra” things that can make the difference between success and failure. Regardless of the agency, participants are taught to write with a linear progression of logic, which leads reviewers through an application without them knowing that they are being led. Coping strategies to overcome the fact that applicants are writing for two different audiences – the assigned reviewers, who read the application in its entirety, and non-assigned reviewers who may have read little, or nothing, of the proposal before the meeting of the review panel – are emphasized. Versions of this seminar include ones that are specific for NIH, NSF, USDA-NIFA, and the humanities, as well as ones that consist of any combination of those entities. Versions that include several or more agencies are, by necessity, more general than those that focus on a specific agency. All participants receive an extensive handout, as well as a field-relevant copy of The Grant Application Writer’s Workbook.